Nothing we’ve discovered since has changed our conclusion. What we have discovered, however, is that much of the evidence used by Mr. Kennedy, et al, is unhelpful and misleading, and Mr. Kennedy’s agenda is broader than we think. Interstate 345 is the elevated freeway on the east side of downtown between US 75 (North Central Expressway) to I-45. Really, it’s just a part of a continuous freeway from Galveston to the Oklahoma border. There are no I-345 signs; this designation exists only on paper. It runs along Deep Ellum, the Arts District, and the Farmer’s Market. You use I-345 if you travel between US 75 and I-45 or between US 75 and I-30 east of downtown. I-345 needs about $100 million in repairs, and the Texas Department of Transportation (TxDOT) intends on starting soon. Why do some want to tear down I-345? The short answer, as we understand it, is some think downtown’s highway loop (Woodall Rogers, I-345, I-30, and I-35E) is a “noose”, preventing residential and commercial development in downtown’s immediate vicinity. Under the theory, removing I-345 opens downtown’s east to development and removes a barricase. This type of high-density, mixed-use development would help Dallas become a “world class” city and create new tax revenue. Also, the theory holds that I-345 is primarly used for through-traffic. Therefore, I-345’s teardown will minimally affect traffic as through traffic will exit affected highways before downtown and re-route to other roads: surface streets, Northwest Highway, I-635, George Bush Tollway, Ledbetter, and others. To the extent traffic elects to flow through city streets between US 75 and the the southern highways (I-30 and I-45), that will simply further economic growth in the area to be developed (i.e., busy streets = more customers). While we have tried to honestly represent Mr. Kennedy’s arguments, please refer to his own site at www.anewdallas.com for his arguments in his own words. The longer answer, which we think is more enlightening to what is actually going on, is that Mr. Kennedy and his fellow new urbanists don’t approve of how North Texans live their lives, and they see the I-345 teardown as a means for forcing people closer to a utopian urban-ideal lifestyle. While Kennedy pays lip service to the concept that we can have our cake and eat it too (i.e., we can have a new urban downtown Dallas without material impacts on everyone else), that is wrong. We also doubt Mr. Kennedy believes this himself; for new urbanists, inflicting traffic misery on everyone else is a feature, not a bug. Looking at our version of the short answer, a few questions jump out. Will traffic impacts be minimal? Does Dallas need the teardown to be a “world class” city? Is there a “noose” around downtown preventing development? We’d answer those questions with, in order, “no“, “that begs the question”, and “we don’t know”. The “A New Dallas” website cites five examples of freeway teardowns in the United States in support of the demolition of I-345, described below. The site claims that these demolitions occurred with minimal traffic impacts while triggering valuable development. Even if one assumes that the development benefits as described by Mr. Kennedy are accurate, none of the examples are remotely similar to the situation in Dallas. 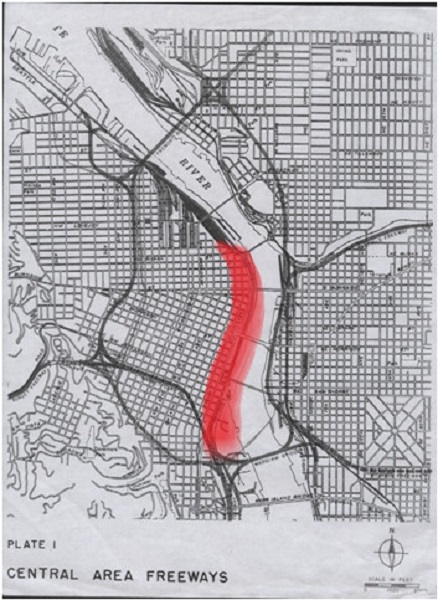 The figure below illustrates the status of the Embarcadero Freeway (highlighted in red) prior to the Loma Prieto earquake of 1989. 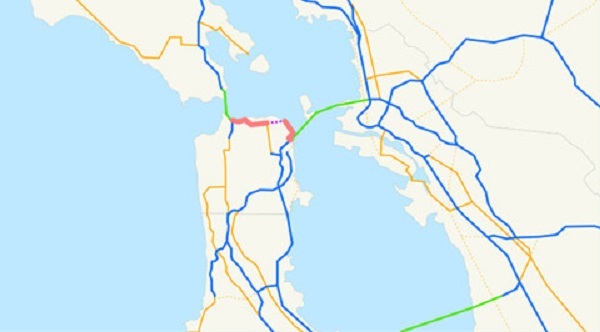 The Embarcadero Freeway was intended as an extension of I-480 from the Bay Bridge to the Golden Gate Bridge (both highlighted in green). It was divisive from its inception and aborted mid-construction: the red dots represent the portion of the freeway that was never built. Cars traveling on the freeway were diverted onto surface streets for about a mile, between the two segments of completed freeway. At its peak, the Embarcadero only had a half of I-345’s daily vehicle count. Mr. Kennedy is wrong to compare I-345 to an incomplete freeway with only a shadow of I-345’s traffic. Perhaps of interest to local politicians, a public referendum to remove the Embarcadero Freeway was defeated prior to the earthquake, and after the Mayor championed its removal post-equathquake (without a referendum), he was promptly voted out of office. 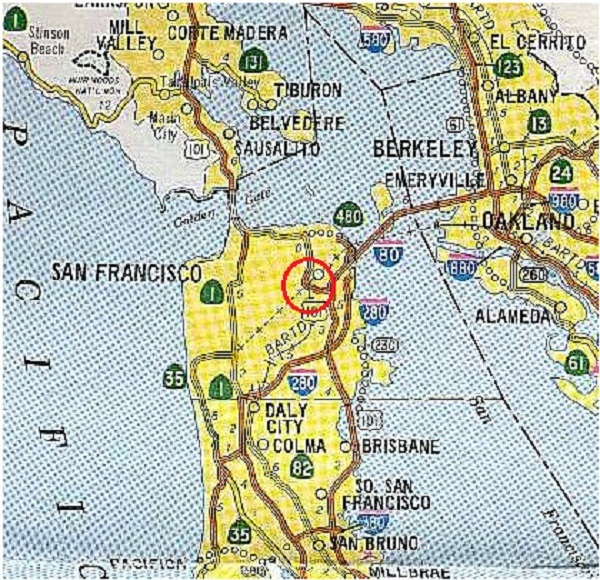 The map below indicates the location of the Central Freeway (circled in red) in San Francisco. In case it’s not clear from the map, the portion of CA 101 extending north from the Central Freeway spur is not a traditional highway and is, instead, a surface road. When originally planned, the Central Freeway, like the Embarcadero Freeway, would have extended north and connected with the Embarcadero. It was also controversial from its inception, aborted mid-construction, and removed following significant earthquake damage. Prior to demolition, the spur was a highway to nowhere, and its removal simply meant that cars entered surface streets less than a mile farther south than prior to demolition. Yet again, Mr. Kennedy is attempting to argue that the destruction of an incomplete, dead-end freeway somehow relates to his I-345 removal fantasy. We may have identified a trend. The map below shows the location of the Park East Freeway in Milwaukee. The part of the freeway that was demolished is in red. The part of the freeway in green however, was never built. For the third time, Mr. Kennedy is comparing the I-345 to an incomplete, “dangling” freeway that ended in surface streets. 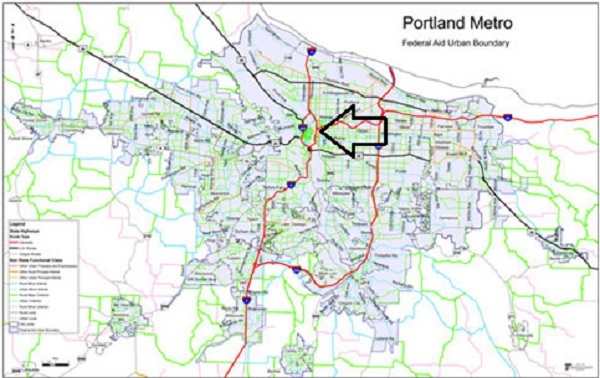 The former position of Harbor Drive within Portland is illustrated below (highlighted in red). Harbor Drive bisected the downtown Portland loop and occupied prime river-front real estate. Furthermore, Harbor Drive was removed only after traffic levels declined thanks to the opening of the Fremont Bridge. 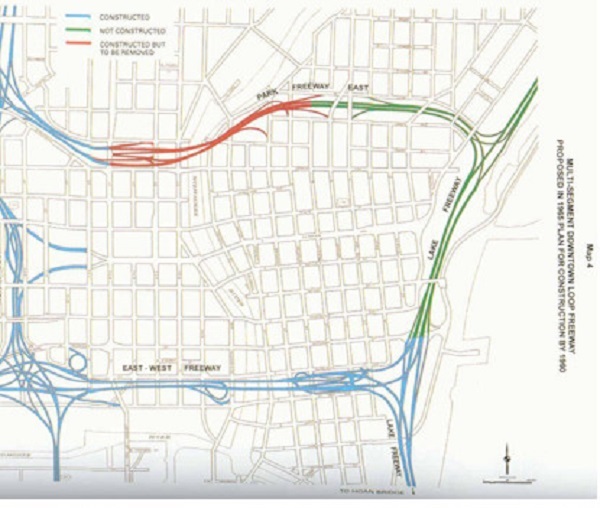 Therefore, the removal of Harbor Drive followed a change that reduced its need, and its removal did not impact the major flow of traffic in the city by breaking up a direct connector between two heavily-used freeways. Yet again, this freeway is not remotely similar to I-345. Though cited by Mr. Kennedy as the West Side Highway, it might be more accurate to describe the demolished highway as the “West Side Elevated Highway” since a new “West Side Highway” replaced the earlier, elevated version. The elevated highway, which was old and too poorly-designed to handle commercial traffic, was closed in 1973 following a partial collapse. It was replaced by a modern, urban highway that was completed in 2001. We do not know what this case study is intended to illustrate, as even the comparative traffic flow figures (before and after demolition) seem to have no value given the 28 year period between the “before” and “after” statistics. In central Dallas, five “Northern” freeways feed into the downtown loop:I-35E, US 75, Texas 114, Texas 183, and the Dallas North Tollway (the blue arrows). 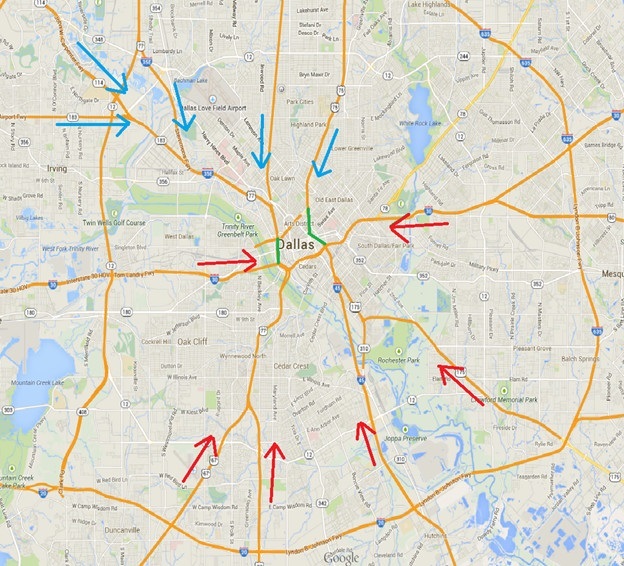 In addition, six “Southern” freeways feed into the downtown loop: I-30 from the east, I-30 from the west, I-45, US 67, US 77, and US 175 (the red arrows). Those two groups of freeways are connected by the two sides of the downtown loop (highlighted in green), I-345 on the east and I-35E on the west. Those two routes are choke points between Dallas’s northern and southern freeways, and the overall capacity of the highway system is limited by the capacity of these choke points. The fact that they are serving a vital function is supported by the large volume of traffic which flows throgh them. If I-345 were removed, any traffic which didn’t “disappear” or reroute to the outer loops (Loop 12, I-635, Bush Turnpike) or to surface streets would be forced through the Mixmaster (the intersection of I-30 and I-35E and nearby freeway segments). For anyone who drives in Dallas, that is terrifying. The Mixmaster is already highly congested, causing peak hour backups on all of the freeways leading to downtown. Shifting even a portion of the traffic from I-345 to the Mixmaster will make things far worse. Note that this will impact not only through traffic, but also commuter traffic into and out of downtown. Even worse, part of the Mixmaster is about to undergo a three year reconstruction ( “Horseshoe” project), during which conditions will further deteriorate. Common sense says that even if you wanted to tear down I-345, Dallas should stage its construction projects so that the teardown occured after completion of the Mixmaster upgrades. This situation, and the 200,000 cars travelling on I-345 each day per TxDOT’s 2012 traffic counts (or 160,000 per Mr. Kennedy’s optimistic but inaccurate figure), is vastly dissimilar to that found in Mr. Kennedy’s case studies. Quantitatively, even the Embarcadero Freeway, the largest cited by Mr. Kennedy, only experienced 100,000 cars per day of traffic. The qualitative differences are even more stark, and make us seriously question how anyone could honestly attempt to rely on such case studies in the first place. Mr. Kennedy seems like a smart man. Based on that, we can only assume he realizes this and just doesn’t care. With regard to what constitutes a “world class city”, Mr. Kennedy sees densely urban cities like New York, Boston, or European cities. We see a “world class city” as one with a large population, healthy job market, and typical “big city” amenities like good restaurants, arts and culture, sports teams, good airports, and major universities. Dallas is already a world class city! The fact that we can drive from place to place does not change this. Dallas also offers something that many other “world class” cities can’t: affordable single family housing. Key to the American Dream is home ownership, and all levels of government have supported that through tax breaks and other means, including the construction of highways connecting citizens to major employment areas. The result is, in many of the high-growth areas of the United States over the last fifty years (e.g., Dallas, Houston, Phoenix, Atlanta), we see lots of suburbs and smaller urban cores (sometimes called “sprawl” for those who don’t like it). There are downsides to any type of growth, but in the absence of fifty years of suburban expansion the greater Dallas area would be a pale shadow of its current self. It might be denser and more walkable, but it would be a lot smaller and wouldn’t be “world class”. It also would not be what, by all appearances, Dallas’s citizens want. Mr. Kennedy also invokes the flip side of this argument, namely that in the absence of embracing his concept of a new urban Dallas we will slowly devolve in to Detroit. We applaud his ingenuity in using a modern boogey man to try to bamoozle us. The argument is also scare-mongering that ignores the historical differences between Detroit and Dallas. Dallas has a stable population, better city government, and a lack of race riots and rampant crime, and has not experienced the near wholesale departure of entire industries, for example. Mr. Kennedy’s argument regarding “world class” cities also begs the question, “What about Uptown, the Dallas area of fastest growth in the last decade?” Does one high growth area adjacent to downtown equate to a provincial city, but two high growth areas adjacent to downtown equal to a “world class” city? As for the “noose” around downtown, or “wall” as Mr. Kennedy also refers to it, we don’t have a strong opinion. Based on the fact that many surface roads flow under I-345, the wall at the very least seems quite porous. In addition, there has been eastward renewal over the last 20 years in downtown. However, Peter Simek at D Magazine strongly disagrees with that line of argument and we do not understand real estate development enough to push harder on this issue, particularly since there are low hanging fruit elsewhere. However, we do have one observation. For pedestrians, cyclists, and cars, getting from one side of I-345 to the other is a dream compared to the closest corollary we can think of: Northwest Highway near Preston Road. That’s exactly what we’ll get if we replace a freeway with a series of congested surface streets. I-345 helps us avoid this mess by getting traffic away from the surface, leaving the resulting area safer and more tranquil for everyone. Mr. Kennedy is a new urbanist. “New Urbanism” is an urban design movement promoting walkable neighborhoods and the balanced development of jobs and housing in urban environments. A central tenet of New Urbanism is that “high density” cities (more people per square mile) are good, and “low density” cities are bad. Corollaries of New Urbanism would be that the features of high density cities are good, such as multi-family dwellings (apartments and condos), and less reliance on cars. Traditional single-family houses are, if not bad, at least undesirable. Cars are bad. SUVs, we can only image, must be very, very bad. Living in Dallas must inflict physically pain on Mr. Kennedy. He would like for us, for our own good, to leave our single family houses, ditch our cars, move into the urban core, and heavily use public transportation. So if the impact on traffic of tearing down I-345 is more intense than he admits, and causes a substantial reshuffling of Dallas living habits, that is probably a good thing in his view, as long as it is realized by Dallasites after the fact. After all, according to Mr. Kennedy, tearing down I-345 is just the first step in reimagining Dallas. How does the teardown start the process beyond obvious new development immediately adjacent to the current I-345? By changing our driving habits. Many teardown advocates love the concepts of “induced demand”, and “disappearing traffic”. What these theories boil down to is if you build more roads, more total traffic will be created, and if you remove roads, the total traffic will eventually be reduced. This seems true. We built highways in Dallas to aid suburb development. The suburbs developed, and now more people use the highways. If we tear down some highways, and capacity is diminished, over time the total traffic will go down as people avoid the traffic issues by driving less or elsewhere. Where would the traffic go? How do people adjust to (more) horrible traffic? By reducing commute length, by using alternate freeways or surface streets, or by using public transportation. People can reduce commute length by either working near where they live or moving where they work. This effect would seem to be a clear positive to a new urbanist. Some people would move closer to downtown to be closer to their jobs (greater density in Dallas), and other people would move to jobs closer to their suburban homes (less driving in the ‘burbs). Mr. Kennedy specifically states that some of the traffic which dissapears following I-345’s destruction will be attributable to people moving to his new urban oasis east of downtown. Hypothetically, the worse the post-teardown traffic, the more rapidly the density of central Dallas would increase as people would be highly motivated to be closer to their jobs. Of course, the opposite could also occur. Jobs are already moving out of downtown, especially to Uptown, Plano, and parts farther north; reverse-commuting is already on the rise, and worse downtown traffic will accelerate that movement. There is also the key issue of most people not wanting to change where they live or where they work. Mr. Kennedy’s proposed disruption is for the benefit of well-positioned property owners and hypothetical people who would move to the urban core at the expense of everyone else. There may also be very real limits on Mr. Kennedy’s perceived “pent up demand” for urban housing. While downtown, Uptown, and newly developed areas may be very appealing to single people or childless couples, relatively few suburban parents will be abandoning houses and school districts for apartments adjacent to downtown. Through traffic, hypothetically, would find different freeway routes through Dallas in lieu of I-345. Mr. Kennedy estimates that 75% of traffic on I-345 does not exit into or out of downtown, and argues that following demolition such traffic would divert to other freeways, such as I-635, or surface roads such as Northwest Highway. Unfortunately, the details regarding traffic origins and destinations are very important, and this is why we and others argue that we should defer any demolition until after a definitive traffic study identifies such origins and destinations. To the extent the traffic in question is true “through traffic”, and both originates and terminates outside I-635, then alternate routes may be less problematic, if we are happy to subject current users of I-635 to more time stuck in traffic. That portion of the traffic, however, which either originates or terminates within I-635 will probably not have alternate freeway options, and will instead have to move to surface streets or, more likely, traverse the Mixmaster. The true breakdown of traffic types on I-345 is poorly understood, and rational people would want to know the answer prior to the irrevocable destruction of the only direct connector between two freeways. But let’s suppose Mr. Kennedy is right, and the 150,000 daily vehicles (75%) of I-345 through traffic diverts. Where’s this traffic going to go? Loop 12, I-635, Bush Turnpike, and other roads. In essence, the rest of the Dallas area are victims who must endure far worse traffic misery so that Mr. Kennedy and his allies can play utopian games while enriching some property owners. Some of Mr. Kennedy’s allies have very explicity cast this issue as a conflict between the city of Dallas and its suburbs, and we have little doubt that additional traffic on such routes is immaterial to them at best. But even if Dallas wanted to turn its back on its suburbs, everyone should recognize that the city of Dallas is more than its urban core. Many of the negatively affected suburbs, and the alternate routes which would aborb through traffic, are either wholely or partially within the city of Dallas! As for public transportation, we’re all for it if someone wants to use it and pay their way. But it strikes us as totalitarian and cynical to intentionally damage existing driving conditions to force people to use public transportation. As one Twitter follower of Wick Allison noted, while bemoaning the width of I-35E, “we wonder why mass transit doesn’t get utilized by the masses. They don’t have to.” Indeed, so we guess Mr. Kennedy should make them. Lets all take a deep breath. We like urban living. Both of us live inside I-635 and enjoy the city’s amenities. Ed lived downtown for a few years and thoroughly enjoyed it. More high-density development in the DFW area, if supported by adequate demand, sounds like a great idea. But urban planning on a blank slate is categorically different from urban re-planning in the midst of a metropolitan area of 5 million people, where billions of dollars have already been invested in infrastructure supporting the city as it exists today. So we do have an issue with tearing down I-345 when a cursory review of Dallas traffic patterns suggests catastrophic effects of a teardown. Perhaps our concerns would be ameliorated by a traffic study, but we won’t know if the teardown occurs before a traffic study is completed. We have a major issue arguing that we should tear down I-345 and, in the words of Mr. Simek, follow “the example set by cities around the country”, on the basis of Mr.Kennedy’s wildly optimistic, deceptive case studies. The proposed removal of I-345 is unprecedented, both in terms of raw traffic flow and I-345’s critical function. So let’s take a deep breath before we do something stupid that we will regret later. Let’s determine what the traffic flow actually is comprised of. Let’s see if other alternatives exist. Perhaps we could also determine what the citizens of Dallas actually want, which is probably not more traffic misery.